Through customer demand we are delighted to launch our new Aromatherapy Pulse Point Roller Balls. Our customers have enjoyed using our Aromatherapy Bath & Body Range, and a growing number suggested that they would also like to have their favourite products in an easy to carry, simple to apply format that can be used in the office, on holiday or wherever they go, so we listened, and here they are! You can choose from Restful Evening, which can be really helpful when you need to relax and restore calm to your mood and mind. It contains organic essential oils of Lavender, Rose Geranium and Roman Chamomile, in a carefully made blend. Or Nervous Exhaustion which can be used to de-stress and balance. The blend contains organic essential oils of Rose Geranium, Lavender and Basil. 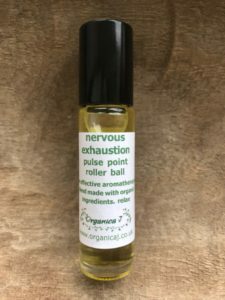 Both are ideal to pop into your handbag, pocket or desk at work, by your bedside cabinet – in fact in a handy 10ml size, very easily portable, so you can take the Aromatherapy Roller Ball wherever you go! Both also are gentle and moisturising for skin containing organic sunflower, sweet almond and wheatgerm carrier oils. Use the Aromatherapy Pulse Point Roller Balls on the pulse points on the neck or wrist. Some clients like to use them on the front of their chest to be able to enjoy inhalation properties at bedtime/overnight. They are also an ideal gift for someone too. Great for Christmas pressies, and perfect for helping you deal with the stressful run up to Christmas !! 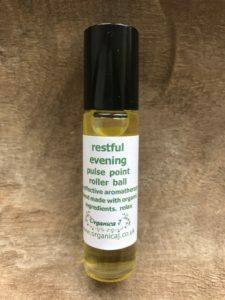 You can buy the Restful Evening Aromatherapy Pulse Point Roller Ball here, the Nervous Exhaustion Aromatherapy Pulse Point Roller Ball here and you can buy the Aromatherapy Bath & Body Oils here.